Enabling people with dementia to live positive, fulfilled lives resulted in the establishment of a dedicated Salford Institute for Dementia. Through research, innovation and education in supportive design and care for people living with dementia, the university aims to maintain independence and promote integrated support in the communities where people live. Core to the Institute’s success are cross-disciplinary working with research and other staff drawn from across all schools in the university including the built environment, digital technology, healthcare and robotics. People with a dementia diagnosis and their carers and family members are intrinsic to the Institute’s work. 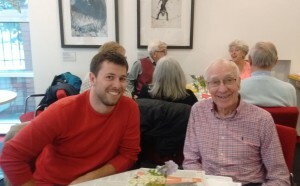 A key team of 12 Dementia Associates with experience of dementia personally or as a carer meet every 6-8 weeks to inform or take part in the Institute’s activities including education (development and delivery of a Dementia Masters’ programme) and enterprise (dementia communication Knowledge Transfer Partnership). Their involvement adds greatly to the work of the Institute to make it more relevant to people affected by dementia. The Associates also help make up the Advisory and and Steering Groups of various projects and studies or are increasingly becoming more ‘hands on’ e.g. as co-researchers. For example, the Institute currently has a three year study (2015-18) funded by the Booth Charities to explore experiences of living with Young Onset Dementia. Its advisory group is made up of informal carers of people with dementia and people with a dementia diagnosis, some of whom are Dementia Associates. There are also two further layers of ‘outreach’ to encourage contribution from people who would not want or would find it difficult to attend meetings at the University of Salford. The first sees the research team attending local dementia support groups to ask for advice about the study design and undertaking. The second layer involves visits to individuals, usually in their own home, which engages people who are isolated or unable to access other venues, or those who may not like group environments or who have caring commitments which make travel to meetings difficult. This helps the research team to reach and involve more than 40 people affected by dementia – who have shaped the design of the study at several different stages.